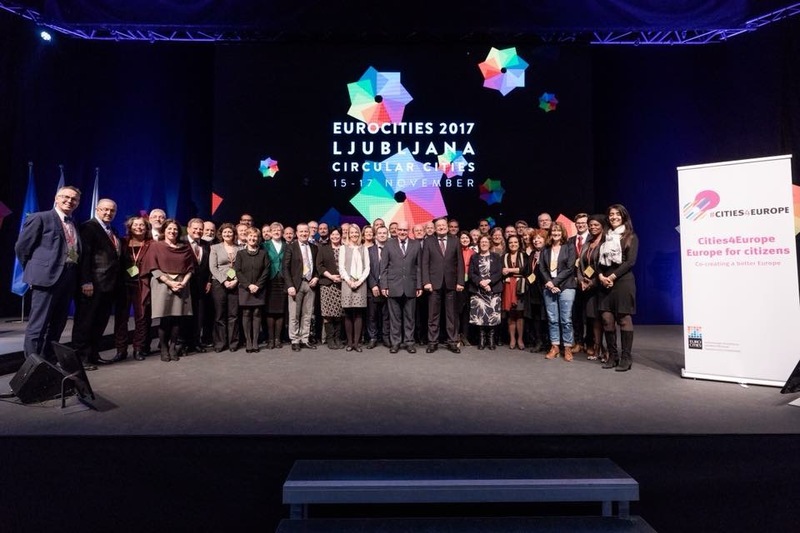 The EUROCITIES Conference 2017 showcased many amazing examples of the circular economy in action in our cities, and demonstrated the energy and commitment to move forwards. We have been doing our best in the past month to share these efforts widely. Our circular economy month, a social media led campaign in the lead up to the conference, highlighted examples of circular transition taking place in our cities though case studies, interviews, videos and graphics. Over the course of the month the #EUROCITIES2017 reached over two million accounts on Twitter, and, in the week of the conference itself, over 200 different accounts were posting about #EUROCITIES2017 generating over 1.3k mentions and 900 engagements. In the category of participation: Gothenburg’s ‘Smart map’. A central element of the conference this year, was our four parallel roundtables, which asked pertinent questions on the circular transition. What are the future jobs and skills gaps that will need to be plugged? How do we effectively involve all sectors of society? How can cities, through their use of green public procurement, work with businesses to encourage circularity along the entire value chain? How can circular principles be applied to urban growth and join forces across different sectors? Overall, many inspiring examples of local level experiments in the circular economy were shared. Many cities spoke to the strong role cities can play in the circular transition. This includes the need to work together with businesses, focus on educating people on circular behaviours, mainstreaming the circular economy and integrating this work across city administrations. Several cities also highlighted the need to work with all levels, including the EU to create a regulatory framework. One of the most important messages, however, was to simply start doing what you can now, as there are many ways that cities can speed up this transition. Timed with the conference, we also published 15 further examples of circular economy work, collected from members of our circular economy task force. The resultant publication, ‘Full circle – cities and the circular economy’ is now available at the EUROCITIES office. As Abdeluheb Choho, chair of the EUROCITIES Environment Forum and deputy mayor of Amsterdam, states in his foreword, “cities are the right scale and provide the perfect environment in which to test out new models”. Our recent statement ‘Towards circular cities’, which was approved by the ExCom in Ljubljana, sets out that, as European cities, we are committed to making the transition to a more circular economy. Not only do cities hold a broad range of roles to achieve this, we can also work with and learn from one another to increase capacities and speed up this transition. EU leadership can help set the right framework conditions by removing barriers to accelerating this transition. Over 400 participants attended the conference, representing over 100 cities, with around 100 politicians taking part. The keynote address, given by Janez Potočnik, co-chair of UNEP International Resource Panel and former European commissioner for the environment, was very well received. As were interventions by European Commissioners Karmenu Vella and Violeta Bulc. You can find photos from the awards here, and follow the discussions from our Twitter page here. Take a look at our Storify, and read more on the conference website. Not to be missed. Take a look at our new publication, 'Full Circle - cities and the circular economy'. And read our new policy statement, 'Towards circular cities'. If you missed the welcoming speeches, or keynote address from Janez Potocnik you can watch them here.